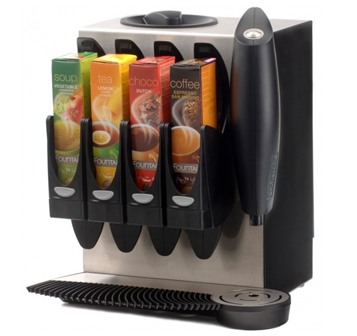 A small compact instant machine that makes an excellent cup of coffee in just 10 seconds. The perfect machine for a small workplace, shop etc. Available with 3 ingredient canisters for 4 drink selections including chocolate. 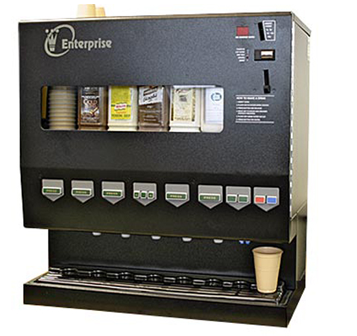 Automatic water refill and dispenses hot water. Proof that size really does matter! 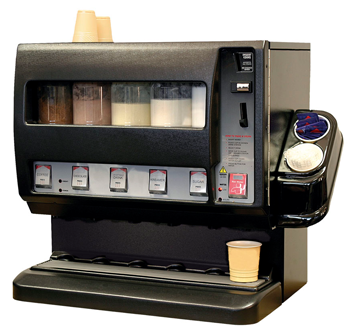 Reigning supreme in the market for mid sized, 3 canister, soluble tabletop machines. More capacity. more features, more style – all in an amazing 66cm/29cm/45.5cm package. Simply the best value for money in today’s competitive marketplace. The Stylish Vision Extra offers the perfect front of house solution for restaurants, bars, hotels & offices. Combined with quality ingredients, good service and filtered water, they provide high quality drinks and satisfied customers. The high definition, fully interactive 19 inch screen intuitively guides you through a variety of user friendly menus. Whether you want to treat yourself to a hazelnut shot or add extra sugar to your drink, the Sigma Touch offers the same coffee shop quality drinks and extra choice available from the high street.